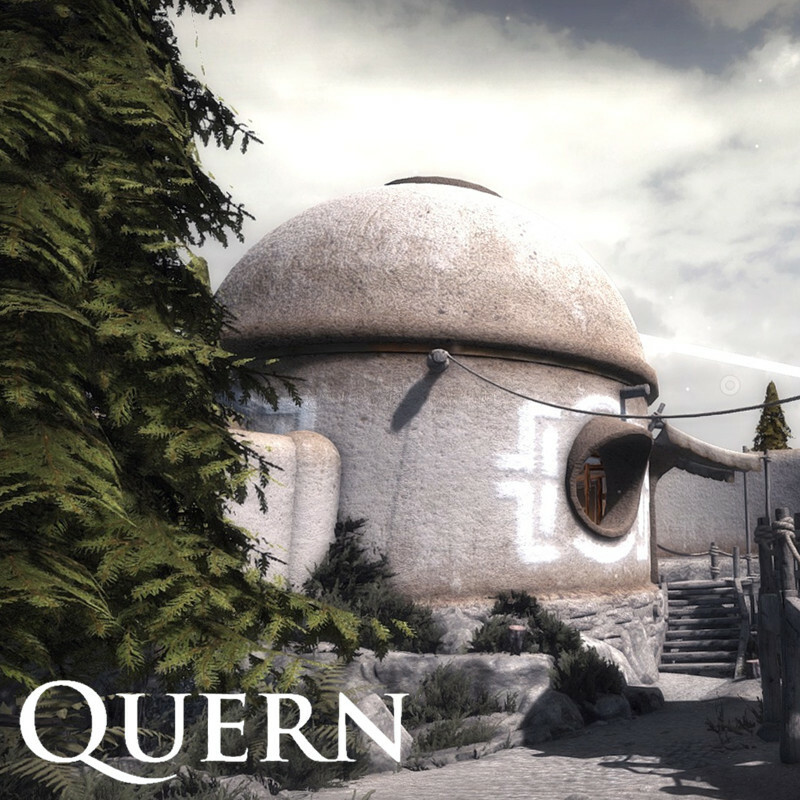 Quern – Undying Thoughts by Zadbox Entertainment is my new favourite Myst-like¹, which, in short, means that the initial premise is like in Myst, while the art style and the architecture is most reminiscent of Riven, and, like in all Myst games, there are strange machinery to figure out and lots of research papers to read and learn from. You progress by solving a wide variety of puzzles, and every little detail counts. When playing I was shedding actual tears of joy, because this is such an amazing game — for an old Myst fan, that is; if you didn’t like any of the original Myst games (made by Cyan), you probably won’t like this either, but if you did, there is a good chance you will love Quern. Quern is in true 3D, so you can move around freely, but you can also restrict your view to 2D (the view is locked and only the mouse cursor is moving), which helps when interacting with some of the puzzles. There’s an in-game notebook, which is nice. Pen and paper might still come in handy if you need to draw something or maybe do some algebra. A camera lets you take photos, which are all stored in the notebook. The island we’re on is quite small, but packed with puzzles and things to explore. You also gain access to new, and increasingly more exciting areas the more puzzles you solve. Each puzzle is more or less unique and everything connects so well (many of the puzzles also teach us something about the world around us). The UI felt fluent and never got in the way. Sometimes I got stuck on a puzzle, but then I took some time off and solved it when I got back. Getting stuck is to be expected and I had quite a few revelations and great moments because of it. The inventory has a bit of a hint system, which I used from time to time to get a short first description for an otherwise obscure item. I don’t know how far this hint system goes or if it might right out spoil a puzzle (which would be ghastly), but, luckily, I was able to resist the temptation to find out — and was so much happier for it, I think. With or without some scrutiny, most items are self-explanatory. The voice acting was great: I found them both to be quite soothing in quality and they never felt out of place. I’m not the best at describing a voice or judging between good and better, but I know when I like or dislike one, and I definitely liked these. There are a lot of invisible barriers (like in The Witness), but I don’t mind them so much and soon got used to them being there, because this is not a game about the hazards of navigating a hostile environment, but all about solving puzzles (like in, again, The Witness). Fast travel would have been nice at times, because there is a bit of back and forth, but that’s not a huge issue either, because with it you might miss those important details you see only when passing by a second+ time). The world could have done with a bit more colour I think, but, on the other hand, the grey, dusty quality of it all makes the little colour there is stand out more. If you notice that details in the environment pop in and out as you look around and find it annoying, this can be fixed by increasing the view distance in the graphics settings — with one exception: parts of the ocean might still show this behaviour if you are up somewhere with long sightlines. The story was nice, but sort of took a back seat for me and towards the end it turned into choosing between two polar opposites while forgetting all the possible greys in-between (which is a little ironic considering how grey the game is otherwise 😉 ). It would have been nice to instead be able to find some middle ground. On the other hand, this extreme polarization isn’t unheard of in real life (unfortunately), so the game is quite realistic in that sense (although more realism in games isn’t always something to strive for). As a result, I ended up not liking any of the characters that much. I mean, they were both alright through most of the game as I could see their motivations, but then they surprised me by showing sides I didn’t see the motivation for, as if they had learned nothing from past events. Maybe this was intended, but it felt too sudden and a little out of character. The in-game notebook is a great addition (it even spoiled me a little 😉 ), although I wish I could rearrange the pages, and separate notes for solved, unsolved, and partly solved puzzles, to make it all easier to sift or skim through, because I easily got up to a hundred pages, so notes for yet unsolved puzzles did take some time to find. Being able to create a table of contents (with links) would have been great too. I still used pen and paper, because old habits die hard, but also because some things were easier to draw on paper (you can add screenshots to the notebook, but they are not always enough) and having your notes and the puzzle side by side was possible only if you kept your own notes. A slight inconvenience with the notebook is that you cannot add notes on a new page without first taking a photo, so some of them might end up being just a waste of space (you might even end up wondering why you took a certain photo when returning after a longer break). ¹For those of you who, by chance, don’t know what a Myst-like is, then it can be summarized as follows: Just like in Myst (the first game in the Myst-series by Cyan), you find yourself in a mysterious location and have to investigate and learn as much as you can about the place you’ve ended up in if you want to get anywhere; there are quite a bit of strange machinery you have to figure out; and the narrator who is guiding you is always this extraordinarily clever and crafty guy — but also sort of dry and humourless — who is into most, if not all, of the natural sciences (like physics, chemistry, biology, and so on) and advanced crafting (like welding, casting, metallurgy, etc, so he can build whatever machinery he needs in order to take advantage of any of the natural resources found on site). This narrator guy has of course already mastered all the ins and outs of this mysterious location when you arrive, so now it’s up to you to figure out how to use all the machines he has built, through thorough exploration and close observation (even the smallest detail can make a difference), but also by reading all the notes left by your guide and learn more. This is also, quite precisely, what Quern is about. Edit: Expect to be stuck on a puzzle from time to time, taking a break, maybe sleeping on it, and then suddenly solving it later when you return. Also, self-motivation is important, because, in a Myst-like, there are no quest-markers nor any other HUD items to prompt or encourage you. There might be a hint system, but the initial drive must be your own: if you expect the game to always tell you where to go, then you will be lost, so “put on your red boots and explore the blues”. Posted in Indie, Review.Tagged 3D, first person view, Myst-like, puzzles.